Ruth R. Young sends the school a $10.00 donation from the Willim Kenly Chapter of the D.A.R. 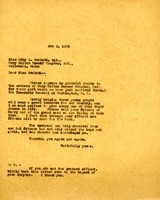 and wishes Miss Berry success with her work. 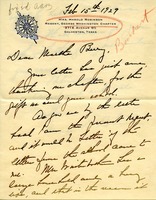 Martha writes to Miss Pease to pass along her thanks to the Polly Sumner DAR Chapter for the gift they sent. 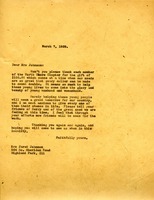 Letter to Mrs. Jared Johnson from Martha Berry thanking her personally as well as asking her to thank the members of the North Shore Chapter for their $150.00 gift to the Berry Schools. Miss Berry informs Mrs. johnson that their gift comes at a time of great need that every dollar can be made to count as double. She explains how much it means to help the young boys and girls attending the Berry Schools as they can into adulthood. Miss Berry also states that helping the boys and girls will make for a better country if they are given their chance in life. 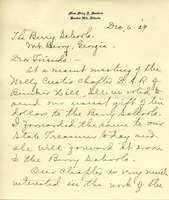 Miss Berry also asks her to tell her friends of The Berry Schools and their great needs and invites her to the schools if she is ever in Georgia. 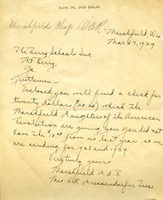 Miss Sanford of the Nelly Curtis Chapter DAR of Bunker Hill explains to Miss Berry that she forwarded the amount of money they wish to send to the Berry Schools to their Treasurer, and she hopes it will be forwarded soon. 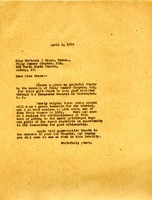 Mabel Loomis Reed, treasurer of the Presque Isle chapter of the DAR, writes to enclose the group's annual contribution, representing Dr. W.J. 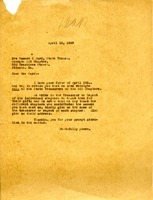 Magill in memory of his mother. 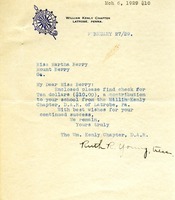 Mrs. Jones writes with a check from the DAR chapter in Robinson for the school. 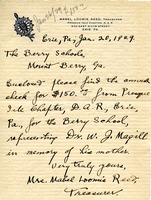 Martha writes to Mrs. Ward to let her know the policy about receipts that Berry sends to DAR Chapters. 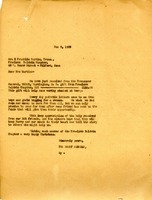 Letter to Mrs. H. Franklin Martin, Treasurer of the Freelove Baldwin Chapter of the DAR, from The Berry Schools thanking them for their $150.00 donation. Miss Berry informs them that they get pathetic letter from boys and girls asking for a chance but that they can't provide them a place at the schools until friends send funds to give them their opportunity. Miss Berry assures them of her appreciation and that she hopes that they will continue to keep Berry and their needs in their hearts. She wishes them all a Happy Christmas as well.